Eversion of a free edge; usually applied to the eyelid. /ec·tro·pi·on/ (ek-tro´pe-on) eversion or turning outward, as of the margin of an eyelid. 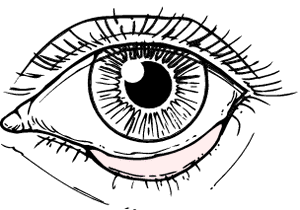 eversion, most commonly of the eyelid, exposing the conjunctival membrane lining the eyelid and part of the eyeball. The condition may involve only the lower eyelid or both eyelids. The cause may be paralysis of the facial nerve, scarring, neoplasia, or, in an older person, atrophy of the eyelid tissues. Compare entropion. A rolling outward of the margin of a part, e.g., of an eyelid. An out-turning of an eyelid, usually the lower, so that the wet, inner, conjunctival surface is exposed to view. Ectropion is commonest in the elderly, in whom weak and lax eyelid muscles allow the lower lid to fall away from the eye. It can also be caused by paralysis of the flat muscle surrounding the eye, as in BELL'S PALSY or by scarring and shortening (contracture) of the lid skin (cicatricial ectropion). A complication of blepharoplasty, in which the lower lid is pulled downward, exposing the surface below. Outward turning of the eyelid margin. The most common cause is a loss of tonus of the pretarsal orbicularis muscle combined with laxity of the medial and lateral canthal tendons, which occurs in old people and affects only the lower eyelid (involutional ectropion). Tears collect in the lacrimal lake and overflow onto the skin of the face. Other causes of ectropion are scarring, burns, trauma (called cicatricial ectropion), spasm of the orbicularis muscle, which may affect either the upper or lower eyelid, or paralysis of the orbicularis muscle in which only the lower eyelid is affected. Ectropion may lead to exposure keratitis as the lower part of the cornea remains exposed. Management includes instilling an ocular lubricant and patching the eye during sleep as a temporary measure, but, if severe, the treatment is surgical. cicatricial ectropion; involutional ectropion See ectropion. congenital ectropion A rare congenital eversion of the eyelid (most often the lower). It may be due to a deficiency of the anterior eyelid lamina. It is usually associated with other disorders, such as blepharophimosis syndrome or Down's syndrome. ectropion uveae A turning of a portion of the posterior pigment epithelium of the iris growing or being drawn around the pupillary margin onto the anterior iris surface. It may be acquired (e.g. following iris neovascularization, neovascular glaucoma, iris melanoma) or congenital (e.g. neurofibromatosis). n an eversion, or rolling outward, of the eyelid margin.